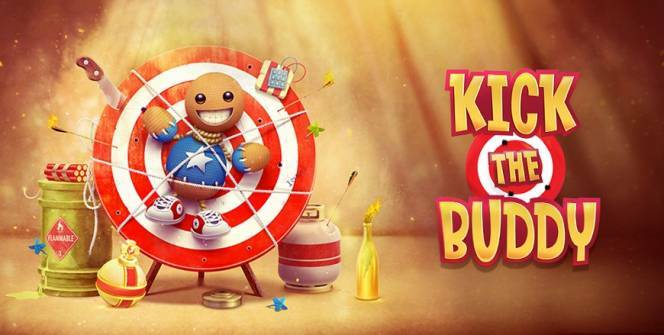 Kick the Buddy is a fun action game created by Playgendary. Players are given an almost limitless arsenal to torch, beat, stomp, freeze, smash and smite the character on screen. With all the violence, it’s more like a digital version of a stress ball than a game. The poor soul forced to take all of the abuse you can throw at him is called Buddy. He’s an animated rag doll with a happy-go-lucky personality that makes you think of a Jim Carey wearing a sack. He looks like a happy enough guy however his luck turns when you start playing. The fun starts when you begin grabbing Buddy and stretching him past his elastic limit all over the screen. From there you can find out what else he can handle by shooting him repeatedly in the head and setting him on fire. If his high-pitched voice annoyed you at the beginning then the sounds of his screams will put a smile back on your face. The violence is non-stop. Buddy never actually dies and despite how torturous the entire ordeal is for him, he always comes back for more, just like a loyal dog that doesn’t know how to hate its evil master. He was designed to feel pain, and you don’t want to disappoint. 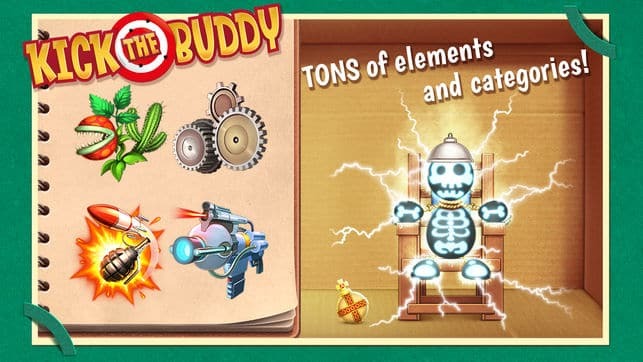 Kick the Buddy for PC stays interesting by giving you a number of weapons to choose from. Standard firearms are satisfying enough however biological weapons and even godly powers are much more fun to use. Just when you start to think that Buddy has had enough, he gets cocky and starts teasing and taunting you which makes it all the easier to hit him with an endless stream of apple pies without feeling guilty. Nice and simple, Kick the Buddy makes a for a brilliant stress-reliever. The numerous and outrageous ways to stomp on Buddy keep things interesting for long periods of time. Freemiums need to make an income however the advertising team on Kick the Buddy probably ran a study to find out how many ads they could fill your screen with before you stroke out, and then put in ten percent more. They are so hell-bent on forcing ads down your throat which is why watching them is the only way to earn a specific type of in-game currency called gold. Randomly taking out your frustrations on a rag doll is fun for a while however there is not much else to keep you interested. A progression system lets you level up as you do more damage to Buddy however you are just leveling up so that you can do more damage to Buddy. A new buddy to whale on would have been a good addition. Parents should note that despite the cartoonish appearance, Kick the Buddy may or may not be suitable for kids, depending on your type of parenting. The rag is put through the ringer however you wouldn’t call the violence malicious since it is done in a humorous way. Buddy never suffers any serious injuries however if you want to play it safe then you may want to get your child a Tamagotchi instead. Sometimes when playing Kick the Buddy, bluestacks ask you fee to pay but gives you option to download some apps. Every time it asks you just select “Install apps” and continue using it free. I hope you enjoyed this article, please rate and share. If you have problems running Kick the Buddy on your desktop or any other issues, leave a comment below.